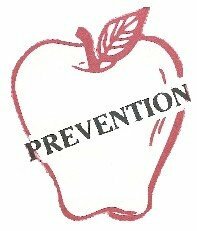 Many of our patients go to their family doctor to check their thyroid and they do a TSH and think that is adequate. The purpose of this article is to help you understand why we do Free T-3’sand Free T-4s. To understand this, we must examine how the thyroid works. The thyroid is controlled by a process called feedback inhibition. The hypothalamus (in the brain) produces a hormone called a TRF (or TSH Releasing Factor) that stimulates the pituitary gland at the base of the brain to produce TSH(Thryoid Stimulating Hormone), which in turn stimulates the thyroid gland to produce I-Thyroxine (T-4). The long-acting, not so metabolically active T-4 is converted in the liver and kidneys under direction of the enzyme 5’deidonase (see diagram) to a shorter-acting, more metabolically active thermogenic (heat-producing) version, T-3 or Tr-Iodo Thyronine. As you can see from the diagram, the only difference between these is a single iodine. It is important to understand T-3 and T-4 are both metabolically active, whereas TSH is not. If you look at the diagram, you will see what this concept of feedback inhibition means. 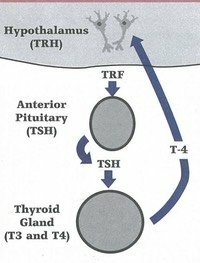 Simply, the pituitary gland produces TSH, which stimulates the thyroid to produce primarily T-4, which, when the level is high enough shuts down the pituitary TSH production and the thyroid regulates itself (theoretically, at least). The medical significance is that your doctor is using an inverse test to measure the thyroid level (i.e., the higher the TSH, the lower the thyroid). At our clinic, we choose to measure the thyroid directly (Free T-4’s and Free T-3s). The reason is because, after practicing medicine for 30 years, I have observed that as we age our pituitary seems to be less responsive to the actions of TSH, which means that an older person might have a normal or borderline high TSH but may be hypothyroid.